About 30 minutes from Yekaterinburg, as I got ready to leave the train, I must have crossed the Euro-Asia border. About 40 km west of Yekaterinburg, stands a 413m marker at the border and Yekaterinburg sees itself as a child of the European and Asian traits of strength and wisdom. Walking down Lenin Avenue, the cafés, restaurants, shops, museums, theatres and cultural centres kept tricking me into believing that I was in one of Moscow's streets. Men in sharp summer-suits and dark glasses and women in short dresses and high heels resonated Moscow's authority and affluence. Moreover, the city was splashed with banners announcing the `BRIC Summit' in Yekaterinburg that would soon host BRIC Heads of States including our own Dr. Manmohan Singh. It is no accident that Yekaterinburg is the undisputed capital of the Urals. But despite all this, Yekaterinburg has not been able to divorce itself from its bloody past. The city will always be best known as the place, wherein the dark hours of 17th July 1918, Tsar Nicholas II with his family was taken to the basement of their home, the Ipatiev House, and assassinated by the Bolsheviks. After the murders, the Romanov bodies were dumped into a mineshaft in Ganina Yama, in a nearby forest, where the Bolsheviks burnt them and doused the remains in acid to hide the regicide. Today, on the little hill at the site of the Ipatiev House - which was destroyed in 1977 - stands the large white, golden-domed Church of the Blood dedicated to the Romanovs, who have now been canonised and elevated to the level of martyr-saints for bravely enduring 17 months of Bolshevik captivity and the brutal end they met. Ganina Yama houses a gated complex with seven beautiful old-Russian style wooden churches - each of which is dedicated to the Tsar, Tsaritsa and their five children. A duplicate of the mineshaft adorned by white lilies (a symbol of the House of Romanovs) serves as a prayer area. My next stop on the Trans-Siberian Railway was also my first city in Siberia - Omsk. I had always imagined Siberia to be a giant wasteland of absolute nothingness but my guidebook assured me that there were a few things to look forward to. Luckily, this was an old edition published before the oil boom, so there was a lot more to do in Omsk! Compared to the cities I had visited so far, Omsk was thinly spread and most of whatever one may want or need could be found on or between the parallel running Marx Avenue and Lenin Street. That's where the city's top two attractions are located: The Omsk State Musical Theatre at Lenin Square on Marx Avenue and the Omsk State Drama Theatre on Lenin Street. The Musical Theatre is curiously shaped like a giant royal, which makes it the subject of both ridicule and admiration. The Drama Theatre, on the other hand, is an ornate white building with a verdigrised green chariot sitting inside its pyramidal head. Going to Omsk and not seeing a play at the Theatre is considered as outrageous as going to Haridwar and not taking a dip in the Ganga. And I was not going to sin! Even before I got there, Krasnoyarsk was a special city. 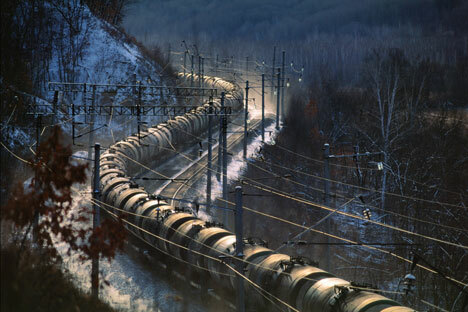 After all, it was the only city on the Trans-Siberian route, where through a friend I knew someone. Yana and Dasha came to pick me up at the train station and took me to my hotel, Tri Medveda, which was situated in the middle of the forest that the city is built around. "How amazing to stay in a hotel in the middle of the forest," I remember saying to myself! The next morning, Dasha took me around the city - or should I say, the forest. We stood at the edge of steep foothills averaging at about 400m above the sea level. Right below meandered the Yenisei River, separating the city from the gigantic rock cliffs of the Stolby Nature Reserve, located 20 km south. Of course, Krasnoyarsk is not all forest. A giant grey clock that is part of the City Hall is fondly referred to as "The Big Ben" by the locals. Right in the vicinity is the Drama Theatre, the Philharmonic Hall, a small park and a monument to 8 Siberian Rivers. On one side, the 3 km long Komunalnii Bridge connects the city centre to its south and on the other side on Karaulnaya Hill stands the tiny, white and cherry red Paraskeva Pyatnitsa Chapel, which features on 10 rouble banknotes. So why did Krasnoyarsk feel like a scary movie? Because on the first day in the city, I lost my camera, which had over 500 photographs of my Trans-Siberian trip so far i.e. from Saint-Petersburg to Omsk. And on the second day, I got lost in the forest for two very long and dark hours when I couldn't differentiate one tree from another to find my way back. On the third day, when I was leaving, Dasha came to see me off to the station where my next train to Irkutsk had caused quite a stir on the platform. My demeanour somewhat betrayed the physical and emotional beating it had taken in Krasnoyarsk and even though I was hesitant to say it, Dasha could guess that I was itching to get away. As I boarded the train, she held my hand and said, "We believe that when something bad happens, it's because something good is about to come your way."